Food for Thought! 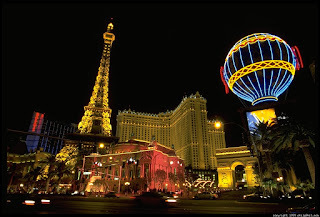 : Las Vegas experiencing the economic downturn. MGM Mirage Inc., the largest casino operator on the Las Vegas Strip, told that more than 400 middle management employees would be terminated immediately in a cost-saving move. The decision will save $75 million annually and came after the company saw weakness since August at its properties, which include Bellagio, MGM Grand, Mirage and Mandalay Bay, spokesman Alan Feldman told The Associated Press recently. The move is the largest and swiftest by a casino operator in the current economic downturn, although the use of so-called "extra board" employees such as dealers and busboys who take fill-in shifts as needed has been down citywide.Budget-tight guests have shown a tendency to spend less in all major segments of the business, Feldman said. "Instead of four days, people stay for three. Instead of a five-star experience, they are going for four stars. Instead of two shows, they're going to one," he said. "There certainly is the possibility that there are people who are also making a decision to gamble less." This was bound to happen. The sub prime has badly hit the investing upper class. Huge capital is eroded. So, the expenses on luxury will come down drastically. Las Vegas Mirage loss is just one of the many companies and sector that would soon follow the trend.